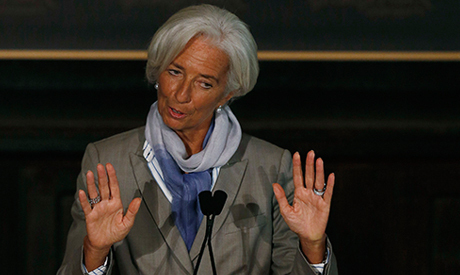 The International Monetary Fund will participate in Egypt's economic summit in February, the fund's managing director Christine Lagarde told London-based daily Arabic newspaper Asharq Al-Awsat on Sunday. Egypt's economic summit – which Saudi Arabia called for after the election of President Abdel-Fattah El-Sisi in June – is scheduled for 21 February and will encourage international companies and organisations to invest in the country and contribute to its development. Lagarde said Egyptian authorities' "recent reform efforts" were "encouraging" and expressed her hope that participants in the upcoming summit will see how these reforms can "help restore durable economic stability and sustainable growth to Egypt." Last month, the Egyptian government called the IMF to report on the country's economic reforms ahead of the conference, namely its recent steps to reform the state budget – which has seen major cuts in subsidies and the introduction of new taxes. Lagarde also pointed out in the interview with Asharq Al-Awsat that the IMF has given advice to Egypt's authorities on tax policy and value-added tax (VAT) reform, which the current budget predicts will increase tax revenues by some LE14 billion. Both the private sector and government will be presenting projects to international investors throughout the conference, with the latter presenting plans for 15 megaprojects worth $100 billion.